New Project dialog now contains two tabs. Tab named Empty creates a new empty project, just like it was before. Tab named From git creates a project cloned from Git repository of your choice. In the simplest case when repository is public and you want to create Papeeria project from the root directory of repo's master branch you need to paste repository URL only and optionally your new project name. In more complex cases when you want to clone a particular sub-directory and/or some particular branch, you need to expand Branch section, wait a little bit and choose branch and folder to take the sources from. 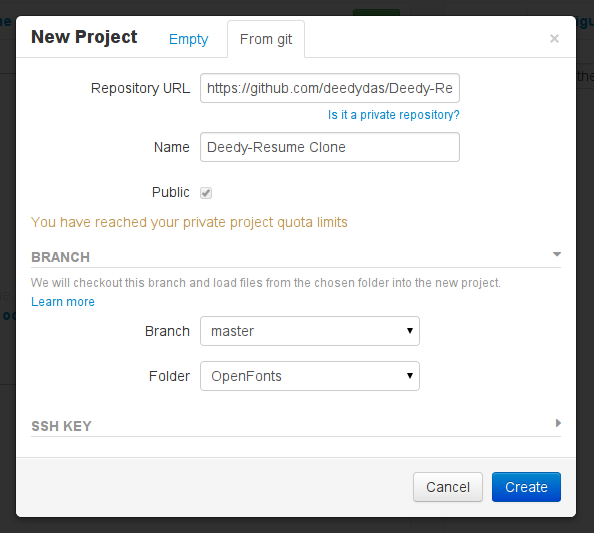 Finally, if you want to clone a private repository, you can do it securely as well. We generate SSH keys for you and you need to authorized a public key on Git server. When it is done Papeeria will be granted access and will be able to clone the repo. More details and instructions for GitHub and Bitbucket are available on our help pages.